There's no such thing as too much information - not where Worktop Express® are concerned! That's why we've decided to launch this helpful information section, designed especially for our customers and chock-full of handy hints on measuring your radius corners, why and when to choose certain products (from end caps to edge profiles) and lots more. And if you have any suggestions for an information guide, please don't hesitate to contact us: we're going to be updating this section regularly and are always on the lookout for new ideas. 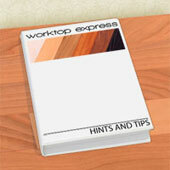 For a full list of the Worktop Express® information guides, please click here. Whether you need a smaller piece of work surface for a corner of your home, or are looking for timber or laminate worktops to use in other projects, we have a selection of options available. If you are looking for kitchen worktop offcuts, our collection includes a variety of items that may be suitable for your requirements. Keep reading to find the perfect worktop offcut for your needs. If you require larger worktop offcuts, our clearance section has a number of solid wood and laminate worktops. This is the place to look if you want a low-cost item or large pieces of discounted worktop for big projects. These countertops are made from the same high-quality materials as our regular range of work surfaces, but are offered at a lower cost as they are non-standard sizes or end of line products. For smaller sections of wood view our chopping board range. Measuring 450mm x 300mm, these cutting boards are suitable for many DIY projects around the home. They are available in most of the same timbers we offer as wooden worktops. Looking for kitchen worktop offcuts to make shelves? Then our range of floating shelves is perfect. With a standard depth of 200mm and thickness of 40mm, they are available in a variety of widths, from 300mm to 1500mm. If required, we also offer bespoke kitchen shelves, which gives you greater choice in width and wood type. Our wall-mounted shelves are ideal if you need long and narrow timber. Whichever option you choose, these items are sanded to a smooth finish and applied with three coats of oil for protection. Our stair cladding kits are manufactured with precision and measure 995mm wide. Available individually or in packs of 12, 14 or 15, each pack contains two pieces of solid oak – one 300mm wide and the other 195mm wide. Our table tops are perfect for a variety of DIY projects and are available in a selection of different timbers, such as oak and caramel bamboo, as well as laminate options, including black wenge and white. We also offer a variety of shapes including squares, rectangles and circles. We supply samples to show our customers what our worktops look like. They are made from the same high-quality timber as our worktops and measure 200mm x 150mm x 40mm. Ideal if you require a small kitchen worktop offcut for your DIY project. Suitable for DIY projects that need smaller pieces of worktop, our plinths and upstands are available in a wide selection of wood and laminate options. Plinths measure 3m x 150mm x 20mm and wooden upstands vary in size, starting from 3m x 80mm x 18mm. These options can be cut to suit requirements easily, but please be aware that our laminate upstands have a fibreboard core. If these items are not quite right for your requirements, we also offer a cutting service which allows you to purchase a worktop tailored to your specific requirements. It will be cut by our experienced team, using the latest technology, ensuring precision and quality. When placing a bespoke order, we will email you a fabrication diagram that illustrates any kitchen worktop offcuts – we are happy to send you these too. This is all the information you need about shopping for kitchen worktop offcuts. If you have any questions, please do not hesitate to contact us. Open shelving is a popular storage solution for kitchens and is a great way to add space to any room in your home. Our bespoke kitchen shelves offer an attractive tailored solution to meet your needs. In this guide, we give you all of the information you will need about our bespoke solid wood floating shelves. To guarantee the highest quality, our fabrication team make all bespoke shelving to order and as such you should allow 5-10 working days for delivery. They will arrive pre-routed and with all the necessary accessories for hassle-free installation. Our bespoke kitchen shelves calculator is our exclusive online tool that will calculate the cost of your tailored floating shelves before you buy them. It has been designed to be easy to use. Simply select your wood type, enter your required length, width and thickness and then how many you would like. Click the ‘get price’ button and the cost will appear at the bottom of the page. If you are happy with this, add the item to your order by clicking the ‘add to cart’ button. This is all the information you need about bespoke kitchen shelves. If you have any specific questions, please do not hesitate to contact us.